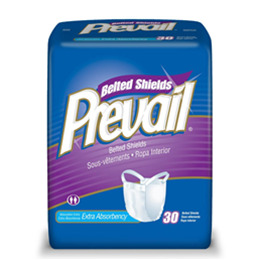 For Moderate to Heavy Incontinence ProtectionPrevail® Belted Shields provide a comfortable fit and feature a Target Acquisition Zone and the Blue Stay-Dry Layer that wicks and locks liquid away providing superior protection and skin dryness for wearers that are typically on the go. The elastic straps are reusable and the reinforced button holes assure a snug, comfortable fit to prevent leakage. One size fits all.